Rebecca J. Summey, daughter of William Summey and Elizabeth Abernathy, wife of Steve Howell. 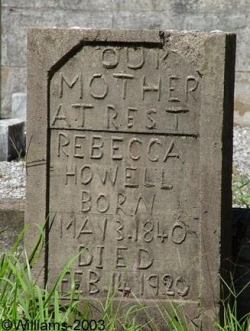 Rebecca's tombstone was lovingly handmade by one of her sons. There are two stories regarding "An Unknown Hero" at Allatoona Pass in Bartow County. One involves Rebecca Summey Howell. 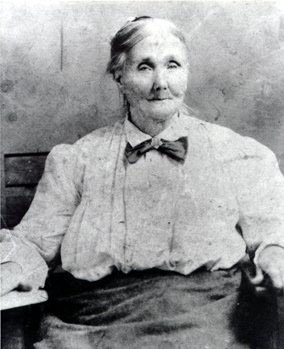 During the Civil War, Rebecca, her sisters and cousins are believed to have buried the "Unknown Hero" whose grave is still seen at Allatoona Pass in Allatoona, Georgia. Mrs. Beck Howell, of Macedonia, died Saturday morning at 1 o’clock in the home of her son, Mr. Bob Howell. She was laid to rest in the Macedonia Cemetery, Sunday. She is survived by four sons, Messrs. Richard, Bob, Martin and John Howell, and one daughter, Mrs. Nancy Banks. NOTES: Rebecca is buried at Old Macedonia Cemetery. Her sons are Richard, Bob, and William Martin. Her daughter Nancy Banks lived in Stockton, California.